Treasure Craft yellow bear in cap, cookie jar, BIG! 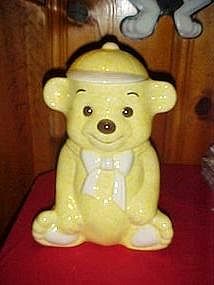 Huge yellow bear cookie jar marked Treasure Craft USA. Measures 12 3/4" tall with cap on. Made of heavy glazed ceramic. Yellow coloring has a speckled sponge effect. Perfect condition with NO damages. A very nice vintage cookie jar.